In the past few years, we have had clients approach RIC with questions regarding “maturity date” and “maturity extension provisions” and their significance on life insurance policies. Historically an unseen risk, due to enhancements in medical care and good health habits, insureds are living longer and the odds of surviving to policy maturity are increasing. The risk of the insured living to maturity is especially true for policies issued prior to 2009, which utilized older mortality tables developed in 1980 or even back as far as 1952. It is not unusual for these contracts to have policy maturity at insured age 90, 95 or 100. The scope of this issue is significant. Surrendering a policy while still alive or being forced to surrender it, due to outliving the maturity date with no maturity date extension available, can create a taxable event causing the owner to lose one of the most tax favored benefits provided by life insurance, following a lifetime of faithfully paying premiums. Most policies issued post-2009 are priced using the 2001 Commissioners Standard Ordinary (CSO) tables with updated trending. The current tables calculate mortality probabilities to the insured’s age of 121. Death benefit coverage or “policy maturity” normally extends to this age, guaranteeing the contract will carry to the death of the insured. Typically for whole life plans, the policy is designed to endow at maturity of the contract, which means the cash value equals the death benefit. If the insured lives to the “Maturity Date,” the policy will pay the cash value amount in a lump sum to the owner. Still, without a maturity extension available in the contract, a taxable event will occur. Policy maturity can become even more problematic for universal life plans, as the benefit by contract varies and these plans are usually funded with the intent of minimizing cash value. Thus, trustees need to further understand what “maturity extension provisions” may be provided in the contract. The maturity extension clause will specify final resolution of the contract, once death occurs. Below is a list of different “maturity extension provisions” available on universal life policies, ranging from most desirable to least desirable. To better understand each of the options listed above, we will review a sample of how policy proceeds are paid upon death following the Maturity Extension. 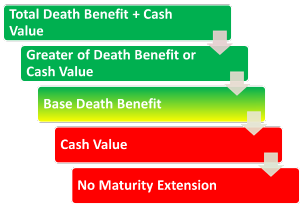 The total death benefit plus cash value Maturity Extension is typically associated with universal life contracts that have an “increasing” death benefit. Most increasing death benefit contracts have a total death benefit equal to the death benefit plus the cash value in the policy. 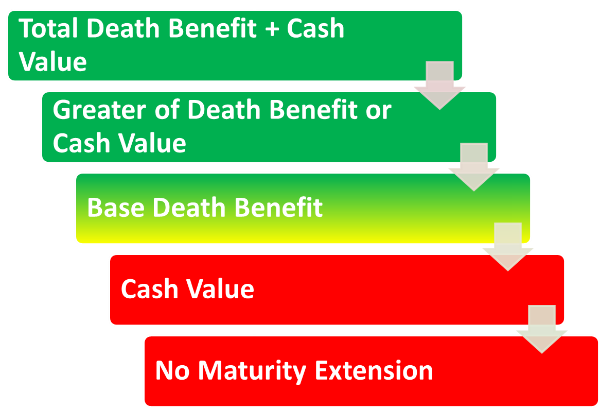 After policy maturity, the total death benefit will continue to equal the base death benefit plus the remaining cash value. The greater of total death benefit or cash value, is the most common provision on universal life contracts. A policy designed to mature with minimal cash value with this provision would continue beyond maturity with the death benefit in place just prior to the maturity date. Alternatively, if the cash value at maturity is in excess of the policy’s face amount, the death benefit provided by the maturity extension provision would equal the cash value. Some universal life insurance policies have supplemental coverage, which increases the total death benefit. If the maturity extension specifies only the base death benefit, any supplemental coverage will be lost should the insured survive past policy maturity. Many universal life contracts have a maturity extension equal to only the cash value. This can be an issue for policies that are designed to have minimal cash value at maturity. For older policies it is not uncommon for there to be no maturity extension provisions. In these cases, the death benefit is eliminated and the insurance company will pay out the cash value in the policy if the insured survives to policy maturity. 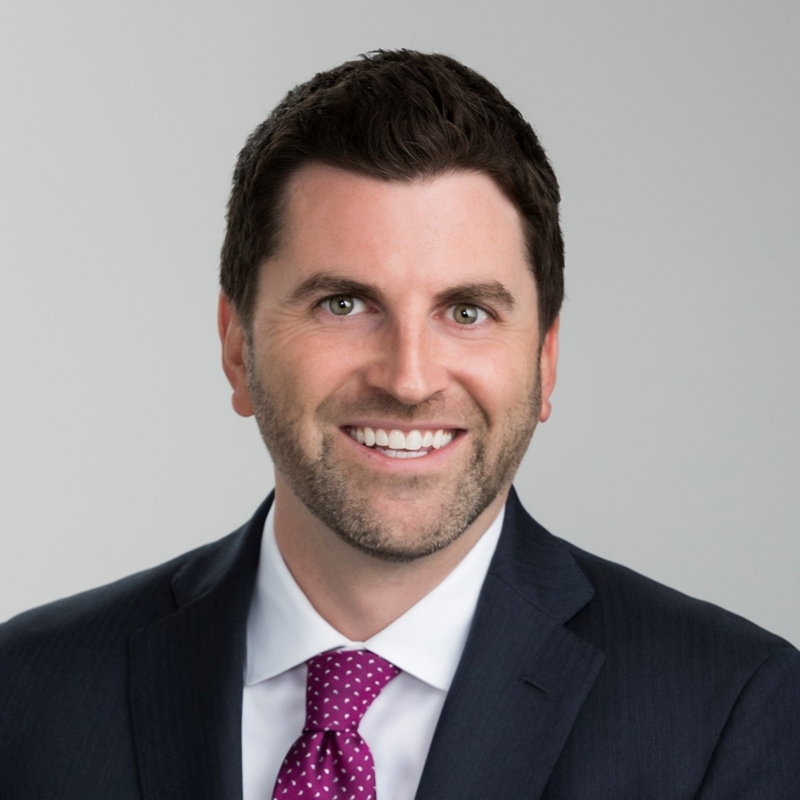 A taxable event would occur if the cash value in the policy exceeds the policy’s cost basis, which is typically the premium dollars paid into the policy. There are remediation options for policies experiencing a significant decrease in death benefit after policy maturity. For example, if the insured is younger than 85 years old and in good health, it may be prudent to replace the current policy with a policy that ensures coverage at death. If the insured is over the age of 85 or no longer insurable, it is important to know the health status of the insured. If they are not healthy, perhaps living to the maturity date is not a concern. If they are healthy, it is important that the trustee understands the risks of outliving the coverage and potentially forfeiting the death benefit and all premiums paid into the policy if there is little to no cash value at maturity. Determine the policy’s maturity date. Review the insurance policy and illustrations to determine the maturity extension provision. If no provision exists in the contract, it is advisable to contact the carrier to provide written correspondence of the post-maturity benefit provision. If insurable, are there more competitive products with maturity extensions equal to the total death benefit available? If not insurable, is the insured aware of the potential drop in death benefit should he or she survive to policy maturity? RIC provides unparalleled service to trustees and fiduciaries managing unique and hard-to-value assets. We are an independent risk manager and Registered Investment Advisor with the specialized expertise required to manage, analyze, value and administer trust owned life insurance, annuities, variable invested assets, closely held businesses and other unique assets. Since 2001, RIC has been the nation’s leading provider of independent risk management solutions for banks and trust companies.